Esteemed Head Sir, My Teachers, School staff and my dear friends. Today We are observing the Republic Day in Our School. On this occasion, I greatly thank my dear Indian brothers and sisters. I feel proud to Speak few words on our Republic Day. Republic means the rule of the common people. We all know that our nation got independence on 15th August 1947. But the British rule was effective up to 25th January 1950 as a special constitution was not constituted up So far. We all felt that We need Our Own Constitution and our own laws to rule over us. For constituting a constitution, a division bench of lawyers sat to frame laws for Our nation under the leadership of Baba Saheb Bhimrao Ambedkar. He became the “Manu” Of modern Indians. After a long two years eleven months and eighteen days they framed Our new constitution which was adopted on 26th January 1950. To memorize this day the 26th January is a national day for us. From the Himalays to Kanyakumari, Kashmir to Karnataka, Eram to Matili, the Hindus to Muslims and Christians to fakirs Celebrate this day with splendor. We prepare delicious food and bake cakes On this auspicious days. Flag march is shown at the India Gate of Delhi by the Air force, Army and Navy wings. After the tri-colour is hoisted the Chief guest addresses the present audience. Colorful programmes of different states are held in Delhi. The braves, intellectuals, and expert police men are honoured on this auspicious day. The President honours Padmashree and Bharat Ratna to them on this day. This festival is dedicated to the public. The people of every corner gathered together under the tri-colour to give their respect. 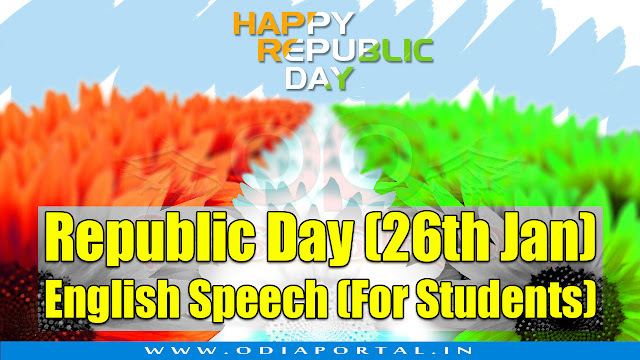 The Republic Day is not an incidental Occasion. It is a day for our self-analysis. On this day We should promise to protect Our nation as well as our language. Let my friends. Come and join our hands together to strengthen the hands of our motherland. Unitedly We should promise to drive out hunger, unemployment, and terrorism from our country. If 121 Crore people join their hands together for the development of our nation on that day, our republic celebration will be fruitful. Jai Hind, Vande Mataram, Vande Utkal Janani.